This image shows the south-facing rim of a pit crater at 68°S in the Sisyphi Planum region of Mars. It is a colour composite made from images acquired on 2 September 2018 by the Colour and Stereo Surface Imaging System, CaSSIS, onboard the joint ESA-Roscosmos ExoMars Trace Gas Orbiter, when the southern hemisphere of Mars was in late spring. This particular crater is known to have active gullies - small, incised networks of narrow channels at the rim of the crater that are associated with debris flows. Ice-rich landslide-like flows of material down-slope can be seen in this image - perhaps related to the 'defrosting' of the ice as the seasons change. 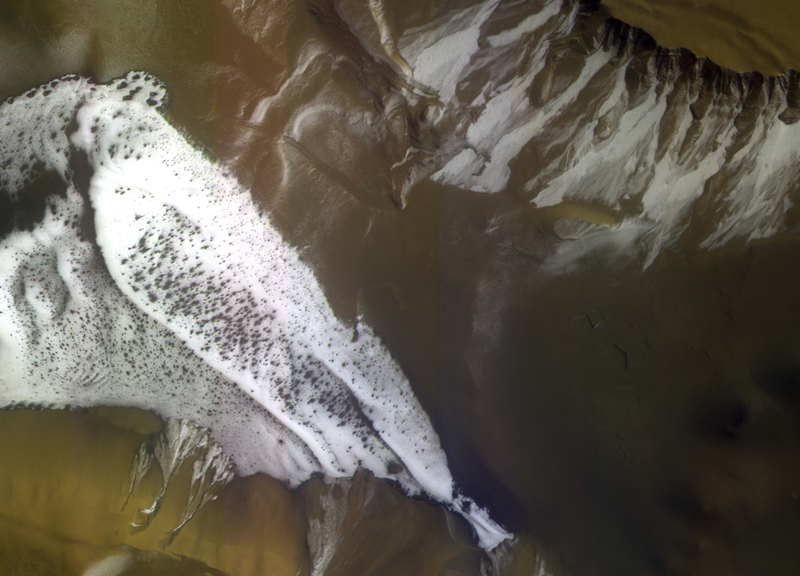 Seasonal changes of ices and frost on Mars is one aspect of the ExoMars orbiter's mission being discussed this week at the European Planetary Science Congress, a major European annual meeting on planetary science, this year hosted by the Technische Universität Berlin Germany.